The varsity CYO volleyball team of St. Eleanor Parish, Collegeville, celebrates their winning season. 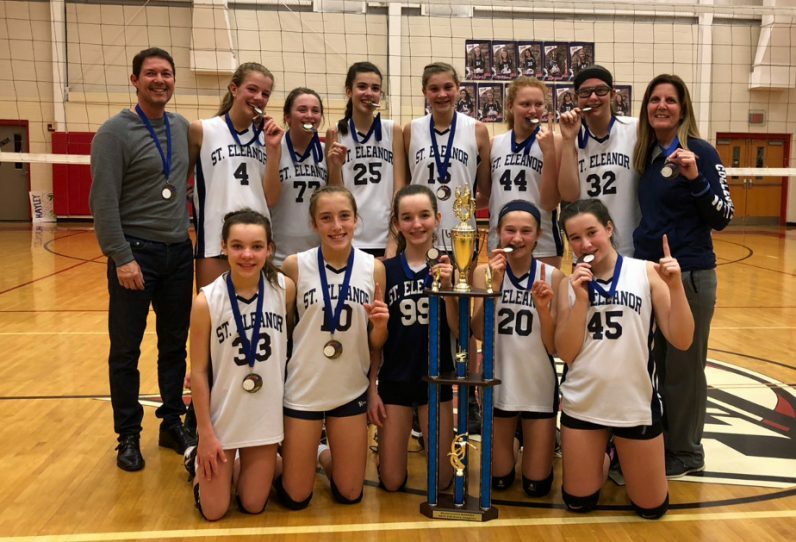 The CYO varsity volleyball team of St. Eleanor Parish in Collegeville captured the Pennsylvania CYO championship last month at a tournament in Pittsburgh. The Crusaders had earlier won their Region 21 title and the Philadelphia Archdiocesan championship. At that tournament Nov. 4 at Cardinal O’Hara High School, St. Eleanor defeated St. Francis de Sales, St. Philip Neri, St. Thomas the Apostle and Visitation B.V.M. in the championship match. It was St. Eleanor’s third consecutive appearance in the archdiocesan championship. Both St. Eleanor and Visitation traveled to the “Dioceses of Pa. State Championship” Nov. 18. Visitation placed fourth in the statewide tournament.